One of the many things I wish I could do is pen turning. Unfortunately I do not have the proper tools, the knowledge, and probably not even the talent it takes to make such works. But for those of you that have the tools and are gifted with such talents, The Pen Wizard might be of some interest to you. You can only do so much to a pen with a lathe, but The Pen Wizard ornamental lathe adds an extra bit of wow factor to your work. With the use of a Pen Wizard and a rotary tool such as a Dremel, it gives you the ability to add spirals, cross hatching, and hundreds of other textured patterns to your otherwise round pens. It even makes it easy to turn your round pens into polygonal pens. 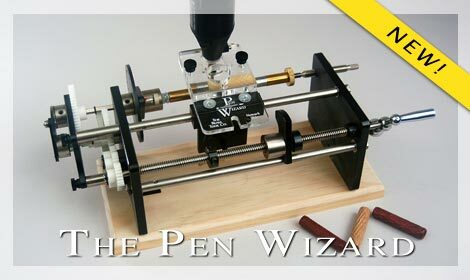 The Pen Wizard cost about $320 and can be purchased from Beall Tool Co. Be sure to watch the video after the Read More.